Spanish designer Patricia Urquiola, Italian architect Rodolfo Dordoni and Belgian fashion designer Kris Van Assche have each designed a one-off version of the “Pontos Décentrique GMT”. 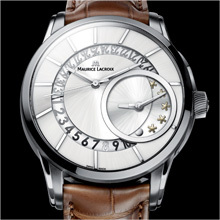 The watches will be auctioned online and the proceeds will be donated to a charity of their choice. 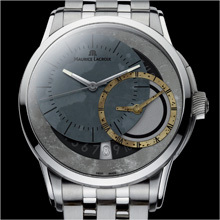 In 2010, Maurice Lacroix and Wallpaper* launched their first joint project with designers Gwenaël Nicolas, Arik Levy and Neil Barrett, a re-interpretation of the 2007 Red Dot Award-winning Pontos Décentrique GMT. Three designers have once again had the chance to create their own interpretation of this classic in 2011, in an exercise that reflected their personality without obscuring the original. For this year’s joint project Maurice Lacroix and Wallpaper* sought uncompromising designers who are true to their beliefs and whose work reflects their own styles. The result is an impressive trio, consisting of Spanish designer Patricia Urquiola, Italian architect Rodolfo Dordoni and Belgian designer Kris Van Assche. 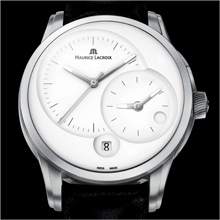 Each of them has now created a unique interpretation of the “Pontos Décentrique GMT” — free of any aesthetic preconditions. The watches will be presented at the “Baselworld” watchmaking and jewelry trade fair in March 2011 then sold by auction on www.antiquorum.com from June1st to 22nd, 2011. The proceeds will go to three charitable organizations of the Designers’ choice. Patricia Urquiola sees a watch as more than just something you use to tell the time, and this is evident in her sculptural rendition of the Pontos Decentrique GMT, the redesign of which she wanted to keep really clean yet playful. The proceeds of the sale by auction of Patricia Urquiola’s watch will go to the Global Diversity Foundation. Movement: hand-decorated automatic mechanical movement ML 121, 30 jewels. Functions: off-center hours, minutes and seconds displays, off-center day-and-night display for second time zone, microblasted brushed silver date display printed in black at 6 o’clock. Case: microblasted stainless steel; on the dial side, convex sapphire crystal with anti-reflective coating; screwed case back with sapphire crystal; water-resistant to 50 m (5 atm), diameter 43 mm. 'Stainless' watch. The result is a spotless re-design of the ML Pontos Decentrique." For Rodolfo Dordoni – whose interpretation of the Pontos Decentrique GMT includes an engraved date mechanism and polished indexes to show the time – everything he designs reflects something of his personality. The proceeds of the sale by auction of Rodolfo Dordoni’s watch will go to the European Institute of Oncology. Functions: off-center hours, minutes and seconds displays, off-center day-and-night display for second time zone, brushed, skeletonized date display in black gold at 6 o’clock. Case: brushed stainless steel; on the dial side, convex sapphire crystal with anti-reflective coating; screwed case back with sapphire crystal; water-resistant to 50 m (5 atm), diameter 43 mm. Dial: sun-brushed silver; applied polished rhodium-plated hour markers; circular opening underscoring date indication (from 3 to 4 o’clock); rhodium-plated hands (hours/minutes/2nd time zone), luminous at night. The weathered textures and stainless steel detailing of Van Assche’s watch reflect his belief in the masculinity of men’s fashion. “Whether designing shoes, belts, jewellery or a watch, it should never be too fancy on a guy,” says Kris Van Assche. The proceeds of the sale by auction of Kris Van Assche’s watch will go to Sidaction. Case: brushed stainless steel; on the dial side, convex sapphire crystal with anti-reflective coating; screwed case-back with sapphire crystal; water-resistant to 50 m (5 atm), diameter 43 mm. Bracelet/leather strap: stainless steel bracelet combined with genuine light brown calfskin. Dial: black gold hand-hammered (external section); special oxidized effect (1st time zone section) ; engraved hours and minutes markers; rhodium-plated hands (hours/minutes) luminous at night; Yellow-gold plating with black spots hand-painted on second time-zone ring and related hands (hours/minutes); metal-coated sapphire crystal over the date indication (at 6 and 2 o’clock).